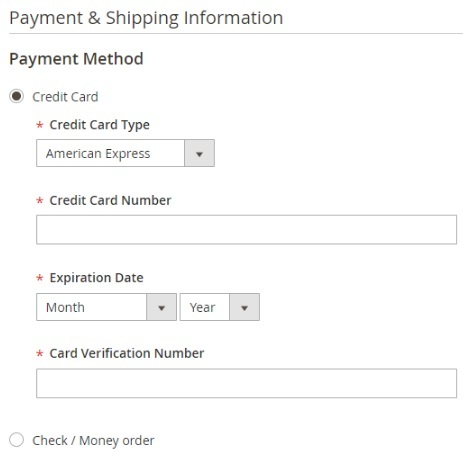 In the following post, we describe a new Magento 2 credit card payment method that allows to save credit card information. Magento doesn’t allow to do this by default, so if you need to process credit cards offline or use a terminal manually, pay attention to the Xtento Saved Credit Cards Magento 2 module. 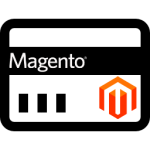 The extension provides the ability to save credit card information in Magento 2 for further processing. If you want to fine tune Magento 2 credit card payments according to your specific requirements, the Xtento Saved Credit Cards Magento 2 module may become useful. It allows to streamline Magento saved credit card method in order to save all credit card information that may be used in offline credit card processing or for manual operations with a terminal. As mentioned above, you can freely save and store credit card numbers, expiry dates, and security codes (CVC, CVV2, and CCV) encrypted in the Magento 2 backend. To make the storage safe, the Xtento Saved Credit Cards Magento 2 extension uses built-in encryption mechanism of the platform. Besides, the sensitive information is visible to authorized admins only. Also note that the new credit card payment method is available in both frontend and backend. How it may be used in case of backend? The most obvious example is related to phone orders. Of course, it is not recommended to tell your card details to anyone, but people do this from time to time. As a result, you can take orders both online or via telephone and process credit card information offline. 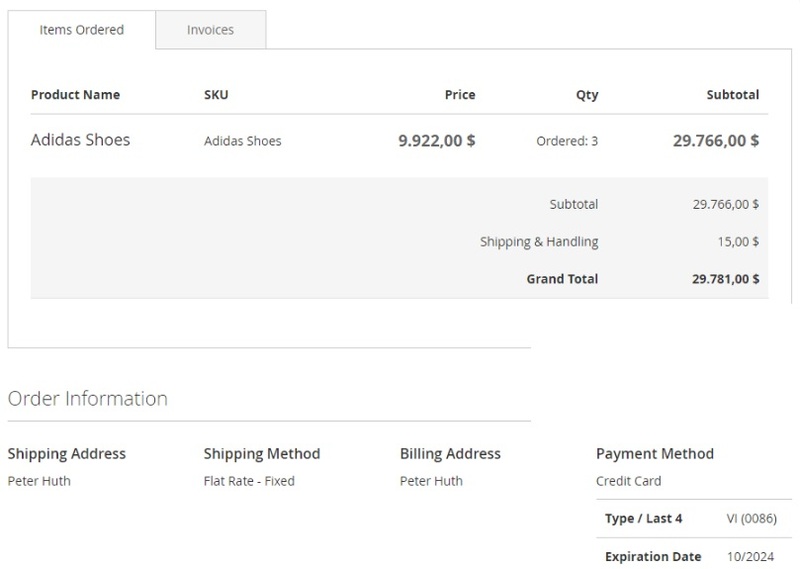 Furthermore, when an authorized admin (admins with the special role) views an order in the backend, the extended credit card information is displayed as well. 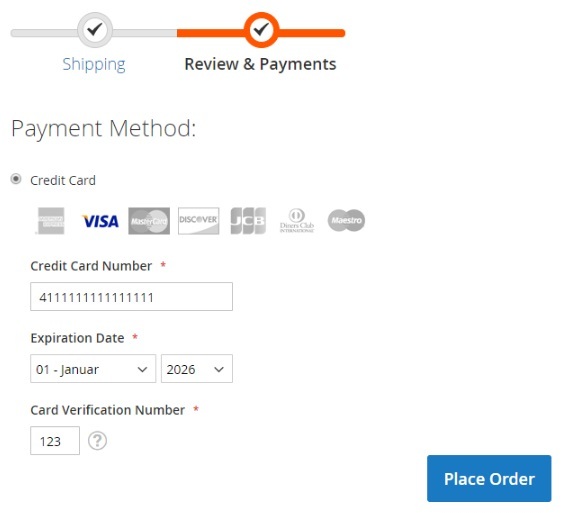 The extension is fully configurable, so you can easily change the name of your new Magento 2 credit card payment method, specify supported credit card types, as well as make CVC required. 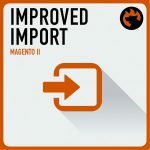 As for security measures, the Xtento Saved Credit Cards Magento 2 module provides the ability to hide sensitive credit card data under the ‘Show’ link. Besides, you can wipe it right after the order is processed right from the order page. Furthermore, if an order is older than the specified amount of days, the appropriate credit card information may be wiped automatically. At the same time, credit card information may be exported with the help of Xtento Order Export. Note that in some countries storing credit card data is prohibited, so check your local laws. If credit card data storing is allowed, make your Magento 2 website as secure as possible, because malefactors are always looking for a sneak path to make a hand of vulnerabilities. 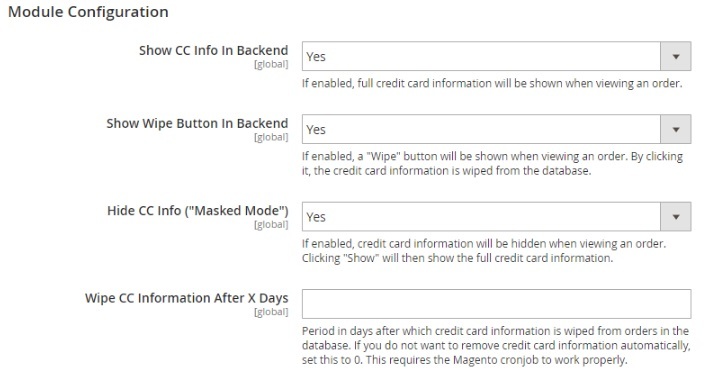 The new Magento 2 credit card payment method should be activated in the configuration section of the backend. 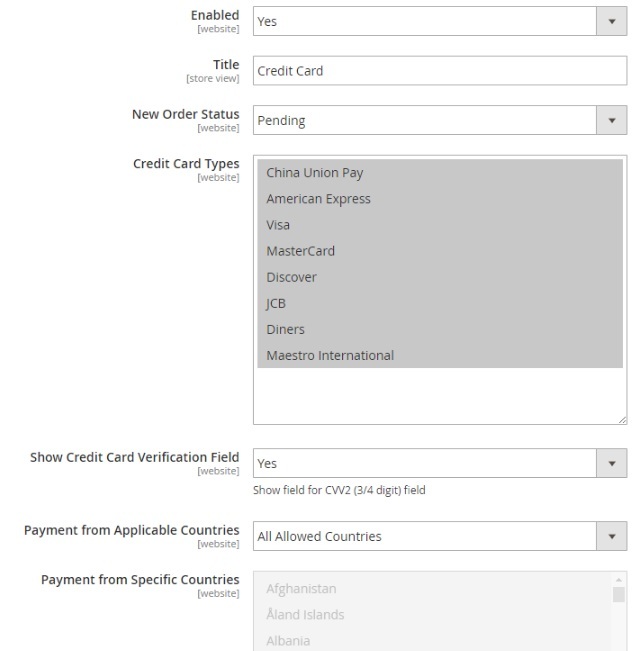 Enable it, specify title (you can use any custom title), select a new order status for this payment method, choose credit card types that will be accepted, enable/disable credit card verification field, specify countries to enable the method to, create limitations related to min/max order total, and specify sort order. Further module configuration is also available in the backend. You can enable full credit card information on order pages, add the ‘Wipe’ button, mask credit card information under the ‘Show’ link, as well as specify a period in days after which credit card data is wiped automatically. After you hit the ‘Show’ link, the information is revealed. And this is how you assign the ability to view credit card details to certain admin roles. 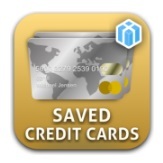 The necessary options are available under Sales -> Operations -> Orders -> Saved Credit Cards – Actions. 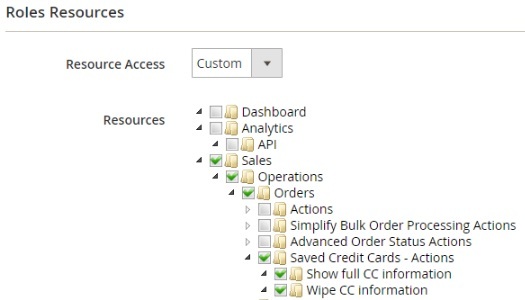 Here, you can enable admins to see full credit card data as well as wipe it. You select credit card type, type its number, expiration date, and CV number. A customer selects credit card type and specifies its number, expiration date, and CV number. As for a customer account, credit card information is limited here due to security reasons.